For years, I’ve wondered about my worth. The movie made me think: How do I know my worth, and how do I know it before it’s too late? In an article for Psychology Today, Amy Morin, L.C.S.W., a psychotherapist, explains that we constantly measure our worth, but we’re often not aware of how we do it. Sometimes it's by our careers, our appearance, other times by our relationship—she compares this method to measuring our height with a random stick. We constantly measure our worth, but we’re often not aware of how we do it. So often, the “stick” we’re using to measure our worth exists outside our control. We measure our worth based on the X’s on our to-do list, the number of matches on a dating app, the likes on our latest Instagram post, the promotions we receive—the list goes on and on. 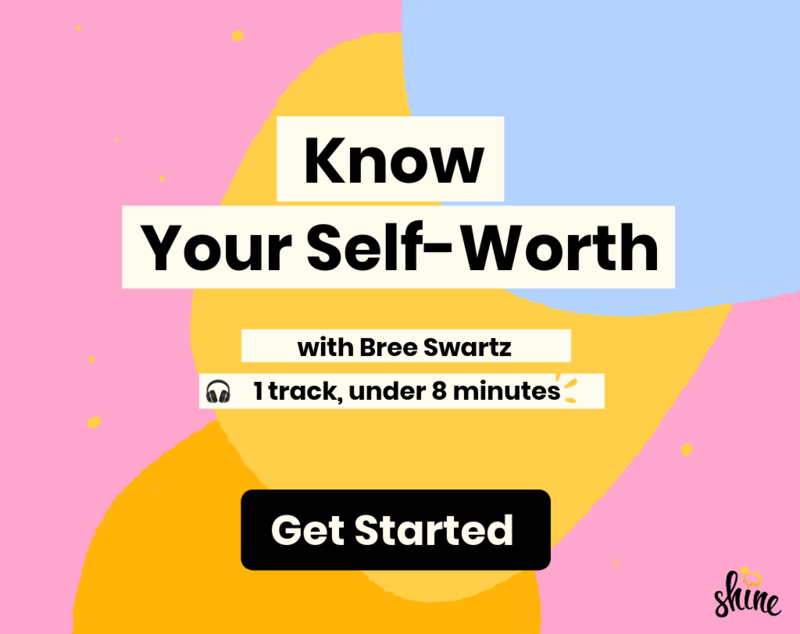 We tend to notice how our sense of self-worth affects us (aka those “I’m not good enough” feelings), but we rarely stop and think about how we’re doing our calculations. We notice how our sense of self-worth affects us, but we rarely stop and think about how we're doing our calculations. How we measure our worth affects the kind of life we live, according to Morin. And when we let other people and things determine our worth? It sets us up for a rollercoaster of emotions. That's why the best “measuring stick” we can use is one that we control. "When you know who you are—and you're pleased with the person you've become—you'll experience a sense of peace through life's inevitable ups and downs." I’ve learned this lesson the hard way. I’m a people pleaser, and I let that determine my worth for the longest time. I always felt like I had to prove myself as worthy of everyone for everything. I did things that made others happier than it made me. I did this so often that I lost track of what I valued. Thankfully, I recently realized that this "measuring stick" set me up for disappointment. I decided that what made me happy mattered more than pleasing others. I’m still a work in progress, but I now try to measure my self-worth based on my own sense of self rather than how other people perceive me. It’s a tactic Morin suggests, too. “Instead of chasing things that temporarily boost your self-esteem, measure your self-worth by who you are at your core,” she writes. When you need a reminder to detach yourself from other self-worth “measuring sticks,” here are 13 things that don’t determine your value in this world. Crossing off items on your to-do list is a satisfying feeling, but you can’t let the number of things you crossed off your list (or the number of things you don’t) control your worth. No matter the type of job you have or how much you love (or hate) it, your job doesn’t define who you are as a person. So what if you don’t have a million Insta followers or Twitter retweets? In this digital world, it can feel like that number determines your value, but you’re more complex than what anyone can see on a screen. Speaking of numbers, your age is just a number. Some people may say you’re too young or too old, but that’s just who you are at the moment, so just be. I’m guilty of comparing myself to others who have the same job title as me and others my age. But I’ve learned I have to manifest in my own lane—and so should you. Manifest in your own lane. You do you. Let them do them. Sometimes others may pass you on this road called life and that’s OK. We’re all traveling at different speeds. Ever tell yourself you’ll run a mile and then beat yourself up when you weren’t able to? It happens, but know that your worth comes from trying at all, not how quickly you crush a goal. Maybe tests freak you out or school is just really difficult. Your grades don’t determine your intelligence, and they don’t measure things like your dedication and integrity. The more friends the merrier? Sometimes. But whether you have a ton of friends or just a couple, what matters is how you treat one another and if you can turn to them in times of need. Single schmingle. It doesn’t mean you’re not worthy of love or of being loved—it means you’re doing you and focusing on loving yourself. Whether you’re a billionaire or don’t have much in your wallet, the amount of money you have or are making doesn’t define your worth. “Going deep into debt to create a façade of wealth backfires in the end because while goods and services have monetary value, they don't reflect your value as a human being,” Morin writes. Bottom line: Your worth is entirely up to you. You are worthy because you say you're worthy and because you believe it. Look within, and trust that you are enough.